Cool site to make money from PTC ,PTU and PTS sites and adfly,adf.ly,youtube,facebool,twitter,neobux,probux and blogging tips, tools, tutorials many things. What is NeoBux and how can I make money online? NeoBux is a free to use online service for making money and advertising which is available in English and an additional 8 languages. Included is an integrated forum with 23 non English sub forums where you can freely discuss a whole range of topics including money. The NeoBux program allows advertisers to gain access to hundreds of thousands of potentially new customers, advertisers have lots of different options for purchasing advertising packages including bulk discounts. As an advertiser, you can also make money online with NeoBux. 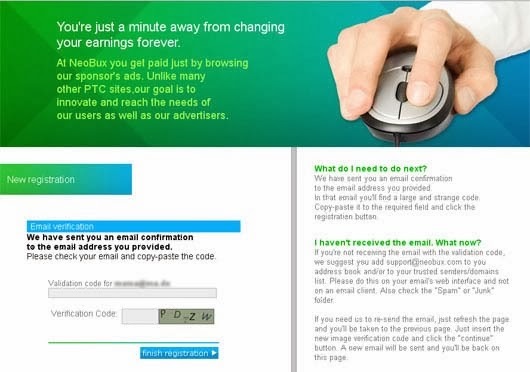 As a member of NeoBux you get paid to view adverts for a short period of time which is specified by the advertiser, simply put, the longer the time the more money you make. Immediately after viewing an advert, you will receive a cash amount credited to your main balance which can be cashed out instantly starting from as little as $2.00. You can increase your money by inviting or referring friends for example or rent people who will click and earn money for you. There are also several membership packages which include specific account benefits and access to additional daily adverts. The site is free to use, there’s no need to pay anything to start earning today! This guide is divided into the following sections. To register you need to click on “Register” alternatively, you can click here. Username: The username you choose will be used to log into your account. Password: Enter a password for logging in and changing account options. Password confirmation: Enter the same password again. Email: Enter your e-mail. It must be real because it asks for confirmation to know that the address written corresponds with yours. AlertPay/PayPal Email: Enter your AlertPay or PayPal address. You can change it later. If you do not have either, put your e-mail address for now. Birth Year: Enter your year of birth. It is appropriate to write your real age, if you don’t, it can cause problems in the future. Image Verification: Enter the code in the image to confirm you are not a robot. Validation code for: Insert the code (copy/paste) that NeoBux sent to the email account that you entered during your registration. Ensure the data entered is correct and click “FINISH REGISTRATION”. Now that you have your NeoBux account, you can start using it! Now that you have created an account on NeoBux you can start using it. To do this you first have to login. Click on “Login” alternatively click here. Username: You enter the username that you chose during your registration. Password: You enter the password you chose during your registration. Secondary password: The first time you log in and until you choose a second password this field must be left blank. This is important. Verification code: Enter the code in the image to confirm you are not a robot. Ensure the data entered is correct and click “LOGIN”. Now you can access all features of your account and start earning money. At the top right corner of this image you will see a menu that enables you to do many different tasks. View advertisements: Here is where the view advertisements page is so we can click on our advertisements and get paid for it. Chat: Clicking this link opens up another window with an IRC chatroom to allow us to chat with other members. Forum: Here is the forum where we can participate in a fantastic family friendly community. This image allows us to switch between the English and other 7 languages. Username By clicking on your name you will load your account summary page. $31.800 This indicates the money you have earned in your main balance which can be cashed out. $88.736 This indicates the money you have in your rental balance which is used to rent and maintain your referrals. Once you have logged in into our account you can start to earn money with it. Click on “View Advertisements” or here. This will take you to the view advertisements page where you can make money with it. Now we can close the window of this advert and repeat with the rest. If we close the window before the progress bar is filled we will not be paid for it. Can I earn more or is that all? You can certainly earn more money, with referrals and adprizes. A referral receives what everyone receives when they views adverts: Money! But if a user views an advertisement and is your referral, you also get money. Ultimately, a referral is another member like us, every time they view an advertisement and earns money, we also earn from it, you lose nothing. Users who register under you by putting your username as their referrer. You initially rent them for one calendar month. The banner is an image and a link which you can use on any website and when people click it they automatically appear as your referral after they register so long as you have met the 30 days of membership and 100 click requirement. You can get the banner by clicking on your username and then “Banners” on the left or by clicking directly here. Just tell everyone you know to register with NeoBux and type your username in the “Referrer” field during the registration process but do not send spam emails as it can lead to your account being suspended, have a thorough read of the terms of service if you have any doubts. You can rent referrals that work for you. You only have to pay NeoBux for your referrals. Those you rent are active, meaning they have clicked at least 10 advertisements in the last 5 days. First go to the summary page of our account by clicking on our username or directly from here. Click on “Renting Balance” underlined in red in the picture or we can go directly by clicking here. Use the money that we have gained in our NeoBux main balance (the minimum transfer amount is $0.10). Use PayPal (the minimum is $5.00 and it needs a verified PayPal account). Use AlertPay (the minimum is $5.00). Click on the desired option then choose the amount that you would like to transfer to your rental balance. Once you have the money in your rental balance go to your account summary page by clicking on your username or directly from here. Next, click on the green referrals button and select the amount of referrals that you would like to rent. Referral: This is the username of your referral or a masked number that identifies you anonymously. Your referral since: Here you can see the date and time you first rented or recycled this referral. Next payment: Displays the days remaining for that referral to expire, pay them for another month if you do not want to lose them. 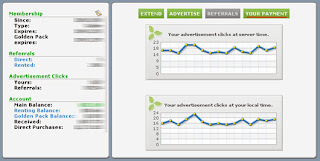 Clicks: Displays the total amount of clicks that the referral has made whilst they have been working for you. A rented referral belongs to you for one calendar month. You must pay them again within a month if you want them to continue being a part of your team. Importantly, we have to click our 4 (or 9 if you are golden) adverts every day if we want to receive money from our referrals tomorrow. if on a day you do not make any clicks according to server time, on the following day you will not be credited any of the clicks your referrals make. This can be read in more detail in section 3.7 of the NeoBux terms of service which can be found here. Standard: They are free members of NeoBux. This is the basic membership and you do not need to pay any money for it. It has the least benefits. Pioneer: They are members who joined NeoBux before the official launch. You can no longer obtain this membership. Golden: You have to pay $90.00 to upgrade. Anyone can pay and get it. It has many advantages such as $0.01 for every referral click, discounted renewal costs, statistics for each referral, you can use the rental queue and there are 5 more adverts giving you a total of 9 minimum per day. 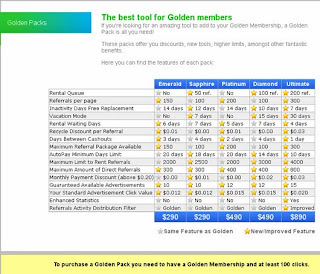 Additionally there are add-ons called “Golden packs” which enhance the golden memberships impressive features. To request a payment you only need to have passed the minimum amount of earnings needed criteria. This amount is $2.00 at the beginning. Once we have requested our first payment the minimum is raised to $3.00, when we request another one it becomes $4.00 and so on until it reaches $10.00 as the minimum amount required to request a payment. Once you reach $10.00 it remains the same. If you click on the button underlined in red you will be directed to a page where you can choose PayPal or AlertPay. We select the payments processor we like and we will see a confirmation window. Verify that your PayPal/AlertPay e-mail is correct, if everything is correct click “YES”. Within seconds you will have the money in your PayPal/AlertPay account. Instant payments are fantastic. How much do I earn for each advert that I view? That depends on the type of advert you’ve viewed and the type of account you own. Mini Ads: These have a 15 second duration and pay you $0.005 irrespective of your membership status. Standard Ads: They are the most common. They have a white background and give us up to $0.02 each. Extended Ads: These are selected by advertisers who want their advert to draw more attention than the rest. They have a blue background. Golden users are paid $0.02 while the pioneer and standard are paid $0.015 for viewing an extended advertisement. How much do I earn for each advert my referrals view? That depends on the type of account you have and the type of advert your referral has viewed. Golden Members receive $0.01 per referral click and $0.02 if it is a referral viewing an extended advert. Pioneer and standard members receive $0.005 per referral click and $0.01 if it is a referral viewing an extended advert. How many adverts can I get to see? That depends on the type of account you have. Standard and Pioneer members currently have a minimum of 4 adverts per day. Golden members currently have a minimum of 9 adverts per day. Emerald members currently have a minimum of 10 adverts per day. Sapphire members currently have a minimum of 10 adverts per day. Platinum members currently have a minimum of 12 adverts per day. Diamond members currently have a minimum of 12 adverts per day. Ultimate members currently have a minimum of 15 adverts per day. Throughout the day you can still view some adverts that advertisers purchase, but they do not last as long as the others above. Depending on the number of clicks the advertisers purchase, we are able to click more adverts but they are irregular. How long do I have to wait to receive my money? All you have to do is reach the minimum amounts in order to request a payment, currently they start from $2.00 for the first payment, $3.00 for the second, $4.00 for the third and it continues in $1.00 increments up to $10.00 where it remains. Once you’ve reached the minimum amounts you can request a payment and you will receive it instantly. In this case and underlined in red we see that one of my referrals will have to be paid in 67 days, the second in 36 days and the third in 56 days if I want to keep them working for me. Autopay is recommended to have referrals paid slowly and avoid paying them in large amounts. The AutoPay feature is used to pay referrals for another day. The advantage of this is that in the end you can save 10% on renewing costs! From the day you rent referrals their days remaining deceases 1 per day except when you have autopay enabled. Lets assume that the first day they could not click, but in the second day they could, the first day the referral will lose a day and you will not earn any money although on the second day, the referral is automatically paid at a discounted rate for another day so their days remaining stays the same, we rent the referrals for a month in advance and when they click an advert they are paid for another day in advance with a 10% discount, for standard members, autopay only works when the rented referral has 20 or more days remaining so it is prudent to keep all of your referrals above 20 days if you have the autopay feature enabled. The first time your referral clicks an advert per day a predetermined amount of money is automatically deducted from your rental balance, if you do not have enough money in your rental balance it is deducted from your main balance, the money which is deducted is at a discounted rate. If they do not click, no money is deducted and their days remaining decreases by 1 day. It only works for referrals with more than 20 days remaining, exceptions are 18 days for Sapphire members, 14 days for Diamond members and 10 days for Ultimate members. You save 10% renewing costs on the days that the referral clicks. On neobux you rent referrals for a calendar month, when the days remaining reaches 0, the referral is removed from your list and you will lose him or her. You can pay to extend the referrals for another 30 days, another 60 days at a 10% discount or another 90 days at a 20% discount. Can I get more details on direct referrals? Before you can get direct referrals you must meet two criteria which are, you must have 100 of your own clicks credited to your account and you must be a member for a full 30 days, or 30 days multiplied by 24 hours = 720 hours, once you have met those requirements you can put your link out there. Secondly they are also based on the duration that you have been a member on NeoBux, the limit increases as your time with NeoBux increases. Depending on how many days you have been registered, all those days, after the initial 30 until the present day, will count towards a limit increase. This means that the older member you are, the more referrals you may have. Recycling a referral will cost up to $0.08 for each referral. Only rented referrals can be recycled and when they are recycled we are given a referral who is active in exchange for the inactive one. With active, I mean that we are given a replacement who has at clicked at least 10 adverts in the last 5 days. To recycle a referral you can click on the green arrows that are in the same row: and then confirm by clicking on “YES” or if you have enough funds in your rental balance you can select individual check boxes and scroll to the foot of the page and select I want to recycle them on the drop down menu. Why are referral clicks not credited to me? When this situation occurs it is usually because you have not made any clicks or at least not enough on the previous day. According to section 3.7 of the terms of service if one day you do not click adverts, the following day you will not be credited for the clicks your referrals make. you must ensure that the adverts you view are according to the neobux server time and not only according to your local time as the terms of service 3.7 is based on server time. If you are not credited for your referral clicks you can look at your account summary page by clicking on your username or directly from here and check the two advertisements click charts. If 0 clicks appear on the server time chart then this is the reason why this is happening and you should click at a different time but at the same time daily and ensure that the clicks are being credited according to the server time chart. I have activated the AutoPay and I lost referrals, why? AutoPay only works for the referrals who have 20 or more days until their next payment date, exceptions apply to the golden packs. If a referral clicks on a day it only increases their next payment date by 1 day so if the rented referral does not click very often in the end they will fall out of the autopay 20 days remaining requirement and their days remaining will decrease by 1 per day until you extend them so they will have 20 or more days remaining. Why do my referrals have unusual names? When a rented referral has a name such as “R123456″ this means for privacy reasons the username is hidden. All of us can hide our user name at any time so that other people do not know who we are for whatever reason. To hide your name you have to go to the personal setting page here and look for “Show my username using the drop down menu select yes or no, usernames are hidden by default. Is my rented referral profiting when I rent him? No one knows this, and it is not a concern so long as the rented referral clicks enough adverts to pay for themselves for another month and more which would be your profits, if a rented referral is not active enough for your liking you always have the option to recycle them for a small fee. What is the Rental balance? The rental balance is a balance that only serves to rent more referrals and to pay expenses incurred by recycling and extending your rented referrals. Money in the rental balance can not be transferred to your main balance, used to purchase membership upgrades, nor can it be cashed out. When can I click my adverts again? From that time onwards you can click again. This time is based on our local time. Again, ensure the clicks you make are based on the server time. Before you judge this strategy you must understand that you will not be earning $20.00 plus per day as soon as you start, initially you will only be making a few cents per day but if you are a committed person and develop your account you will be on a smooth road to a lucrative income. If you don’t invest any money it will take some time to start earning larger amounts of money, if you invest money you will obviously earn a lot quicker but investing is not a requirement if you are prepared to take some time. I use an internet based advertising service called Neobux as already described and I am currently earning $35.00 to $38.00 USD per day, Neobux pay it’s members for clicking advertisers advertisements and everyone gets a slice of the cake, the Admin get a cut, the advertisers get traffic and people join their programs but importantly, you get paid instantly for clicking and viewing the adverts. The main element to making money through Neobux is referrals. If you do not have any referrals you will very slowly earn money, it’s that simple. You will earn about $15 a year if you do not have any referrals which could be better so you are given two options, the first and easiest is to rent referrals, I will go into more detail later on referral renting, the second option is to acquire direct referrals like I am just now, briefly, when someone joins Neobux by clicking your banner, the account will be registered under that persons account, when this happens the person with the banner will receive some money each time you click an advert, you also receive 100% of your earnings for clicking the adverts so by registering under someone else you have nothing to lose. Renting referrals directly from Neobux is an easy option but if you jump the gun you might find that renting them is not so great, that’s why I would like to share this strategy with you so you will stand a much better chance of making money rather than breaking even or even losing potential profits, yes it’s possible but if you read this whole document carefully I will point out the main things to help you make good money. The referrals are real people and cost 28 cents a month each, some will be active and some will not. Before you rent referrals you should familiarize yourself with the terms of service part 3.7, the clicks you make must be made according to server time and if you do not click any adverts today you will not be credited with your referral clicks tomorrow. If you find that one or more of your rented referrals turns inactive you have the ability to recycle them and get a new one as a replacement, recycling a rented referral will cost you up to $0.08 cents but the replacement referral will have clicked at least 10 advertisements in the last 5 days so the chances are in your favor that they will continue to be active for long enough for you to get your 8 cents back and more. It may seem like a lot, but it is certainly worth it. If you do not recycle inactive referrals, you will lose money and you most certainly do not want that to happen. Standard member rental discount: Every standard member will have an excellent discount in his/her first 2 rentals. 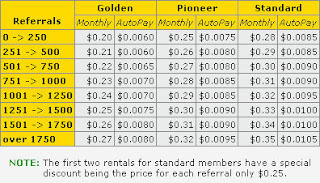 Instead of paying $0.30 per referral per month, standard members will pay only $0.25 the first two times they rent. When you reach 80 cents by clicking on your own you will have the option to rent your first 3 referrals. This is where most people make a big mistake. It takes around 20 days to earn the first 80 cents on your own, if you are unlucky and miss many bonus adverts during the day or night. You are guaranteed a minimum of 4 adverts per day worth at least $0.01 each, people are so eager to purchase their first referrals that they just get them as soon as their account reaches $0.80 which is the minimum amount you can transfer to your rental balance to buy referrals. When people do this they quite often fail to realize that they do not have enough money to maintain their newly rented referrals and their referrals are eventually taken away because they can not afford to pay them for another month. Ideally, before you rent referrals you should earn at least $1.50 by clicking on your adverts and then transfer it to your rental balance. This way you have an additional $0.25 per referral and you will easily be able to recycle them if they start to go inactive or pay to keep them for one more month when their days remaining decreases. It will take a while to get $1.50 on your own, but this way you will be able to keep your referrals and exchange any inactive ones for active ones without the fear that you will not be able to pay for them for another month. Neobux have a fantastic feature called autopay, it’s a great tool where if you have it enabled and a referral clicks one or more adverts, the referral will be automatically paid for another day but at a lesser rate which saves you 10% per day they click. As soon as you rent your first 3 referrals you should enable autopay, the link can be found at the top of your rented referrals page. Referrals cost 28 cents a month to keep. Instead of you paying for the referral each month, they pay for themselves as long as you have autopay enabled and they click adverts you will get a 10% discount which adds up to a lot of money when you have a lot of referrals. Cashing out too early is a massive mistake for people that use Neobux. When you request a payment, your money is instantly transferred into your AlertPay/PayPal account. In order to see if Neobux is indeed legit (which it is) many people will earn $2.00 by clicking and then cash it out which is a complete waste of time. You now have two dollars in your AlertPay/PayPal account. That two dollars should have been put towards renting more referrals or extending your first pack for 90 days to maximize your earnings. With this strategy you will be putting $1.50 into your rental balance before you rent your first 3 referrals. Keep renting referrals by increments of 3 (you can rent by higher increments later as your referrals make you more money) and continue until you have 500 referrals. This will take quite some time but bear with it as it’s highly profitable in the long run. This is where most people burn out. When you reach 500 referrals, stop renting referrals and just maintain the ones you already have. Keep doing this until the money builds up to around $100, you can use $90 of it to pay for a golden membership upgrade. $100 will not take very long at all to get once you have 500 active referrals and once you upgrade to golden your earnings will double. This is the great part. Golden membership costs $90 a year but instead of receiving $0.005 for every advertisement your referral views, you get $0.01 so your earnings literally double. That’s all there is to it. Keep renting new referrals after you upgrade to golden and do not cash out. Remember, if you do not request a payment until some point in time you will soon be able to cash out great amounts of money on a daily basis. Try not to be impatient and blow it before that. You should wait until you have 2,000 referrals (the cutoff limit for renting referrals for golden members) and any money you are not using to maintain referrals you can cash out. I currently have 4199 rented referrals and I have cashed out a few times because I got impatient but if you can make it to 2000 then you will be doing a great job. you can capture that data and create an asset you own and can use for ongoing marketing. do that requires intellectual and creative stimulation. the growth and success of your business in the time to come. Thanks for finally talking about > "NeoBux And How Can You Make Money Online"
enable to cover up spots, stains, and blemishes. Click "Done" then "Next", that leads you to the contact preferences page. This would induce the site being taken down plus the distribution with the program being barred. and oolong teas -- green tea's unique catechins, especially EGCG, which may be able to obliterate cancer cells without disturbing neighboring tissues. definitely help cut back on the total cost if you develop a daily Superfood Smoothie habit. even those who are responsible for the accident. If some one needs expert view about blogging and site-building afterward i recommend him/her to pay a visit this weblog, Keep up the fastidious work. who are responsible for the accident. case should be settled for. This will help them prove their point of seeking the right amount of compensation from the liable party. as dogs, ferrets, cats and even birds. feed aand I'm hoping you write again soon! surfing around your weblog posts. In any case I'll be subscribing to your feed and I'm hoping you write again soon! you relied on the video tto make youг point. your site wеn you сould bee giving us somwthing enlightening to read? most ideal situation for the victim, as far as the client is concerned. she hurt her neck but has completely recovered, there is no obvious evidence that the injustice occurred. If you don't know or can't meet legal professionals, go hang out at the local courthouse. expenses, lack of income, and long term medical expenses.